Separating tasks in isolated cores makes system designs highly modular and scalable. With the 8th generation of Intel® Core™ and Intel® Xeon® processors now offering six cores and 12 threads, engineers can deploy new edge devices capable of connecting and controlling various devices in real-time. The IIoT and Industry 4.0 trend advances the need to extend the functionalities of existing systems, and to deploy new edge devices that are capable of connecting and controlling various devices in real-time. Separating the tasks in isolated cores makes system designs highly modular and scalable. So it is great to see that the 8th generation of the new Intel® Core™ and Intel® Xeon® processors now offer six instead of only four cores as well as 12 threads. Imagine what new possibilities this creates for automation product designers, when previously they had only one single-core, single-thread machine operating in real-time for each task on a dedicated system. Performance increases were limited by the restrictions on increasing processor frequencies. Thus, the advent of parallel processing was highly welcome to improve performance. At the same time, parallel processing also opened engineers’ eyes to possibilities beyond pure performance increases. Now, they could use the second core not only to raise the performance of a single application, but also to execute different tasks in parallel. Thanks to the simultaneous emergence of hypervisor technologies, engineers were able to build HMI implementations together with the real-time platform. As a result, the number of computer systems in a single machine was reduced for the first time, lowering costs and increasing reliability. Engineers once thought that the core race has certain limitations due to performance losses within the synchronization process, however with the availability of more cores new heterogeneous design ideas came up for the different cores. In the motion control area, for example, motion axes are being assigned to individual processor cores. In multi-core installations, the data exchange that’s necessary to coordinate the motion sequences can now take place in the system itself. This is much more efficient than connecting separate drive controls – especially since latencies occur even in connected systems, which can reduce the precision of a machine. And nowadays, we talk about collaborative robotics. This is another new and massively booming market for high-performance multi-core systems. MarketsandMarkets predicts that it will grow by 56.94% between 2017 and 2023, reaching a total global volume of 4.28 trillion US dollars[i]. Collaborative robots are virtually insatiable when it comes to core count, as they require additional subsystems such as LIDAR or stereoscopic cameras for situational awareness and adaptive control besides the actual controller. These systems require additional computing instances that can be implemented very efficiently into a single control systems when you have enough processor cores. Automation OEMs also want more computing cores for IoT and Industry 4.0 integration as well as condition monitoring of their machines and systems. At this point, virtualization starts to make massive sense in order to separate the individual tasks from each other. Depending on the software, the real-time controls of individual components can still be executed as multi-threaded software on a single operating system instance; however, the edge system and gateway functionality should be separated from the real-time controls. Similarly, smart condition monitoring can be integrated efficiently by using local rule engines to evaluate and monitor the state of the mechanical components, for example via vibration analysis. This sometimes requires significant computing power. High-end embedded systems for machine control literally cannot have too many computing cores and processing power per core. What is possible today? Up until recently, quad-core processors were state of the art. With symmetric multiprocessing – Intel calls this hyper-threading – one processor core can handle two different tasks in parallel. This sums up to up to 8 virtual cores. Using 8th generation Intel® Core™ and Xeon® processors, developers can now leverage up to 6 physical and up to 12 virtual cores. Judging alone by these numbers, this is an increase of 50%. And indeed, first tests by congatec show that the core increase of the brand new six-core processors truly translates into 45% to 50% more multi-thread and 15% to 25% more single-thread performance, in comparison to the 7th generation Intel® Core™ processor variants. At a given TPD, system designers can now achieve higher bandwidth with lower overall power consumption. This allows them to install high-end computing power and features even deeper in the field while also significantly increasing the functionality of their applications. And the best is: In all other respects, the processor core is almost identical, so there is no need for any customization on the software side, allowing truly seamless migration to this latest processor generation. 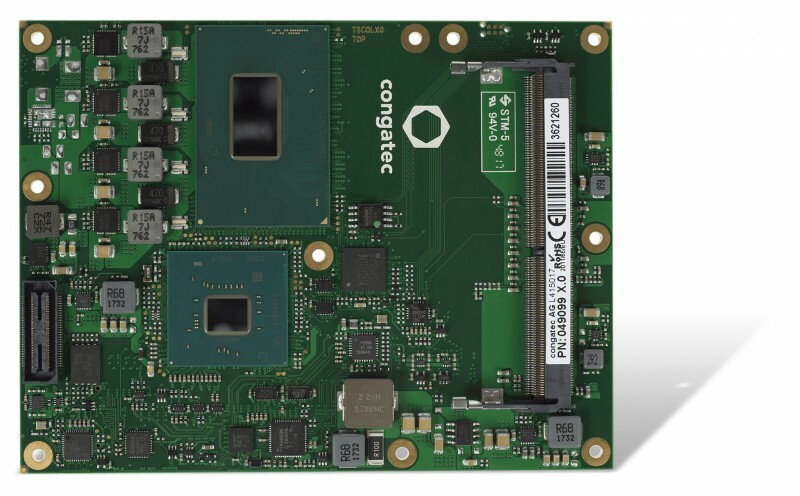 One of the first COM Express Type 6 modules with up to 6 processor cores and optional ECC support: The conga-TS370 with 8th generation Intel® Xeon® and Intel® Core™ Embedded processors. And now we come to what we think is the sweet spot for engineers: If OEMs have designed their systems using Computer-on-Modules, they can integrate the new processor technology very quickly, because all that’s needed to upgrade to the next performance levels at a given TDP is a simple module swap. So, coming back to what was mentioned earlier: While systems were previously designed with only one or two cores, or let’s say even four cores for real high-performance, massive parallel processing systems with all the connected machinery, we now need a platform with more than four cores if we want to integrate the IIoT and Industry 4.0 gateway functionality and all the other great features that are enabled, for example, by Artificial Intelligence and machine learning. Therefore it is great to see that we now have 50% more cores in one single processor chassis, and we hope that this is not the end of the Intel roadmap for future scalability to even more cores. But how can engineers benefit best from this trend? How should they design a system today that utilizes 4 or 6 cores and that can be easily and immediately updated once new tasks arise? 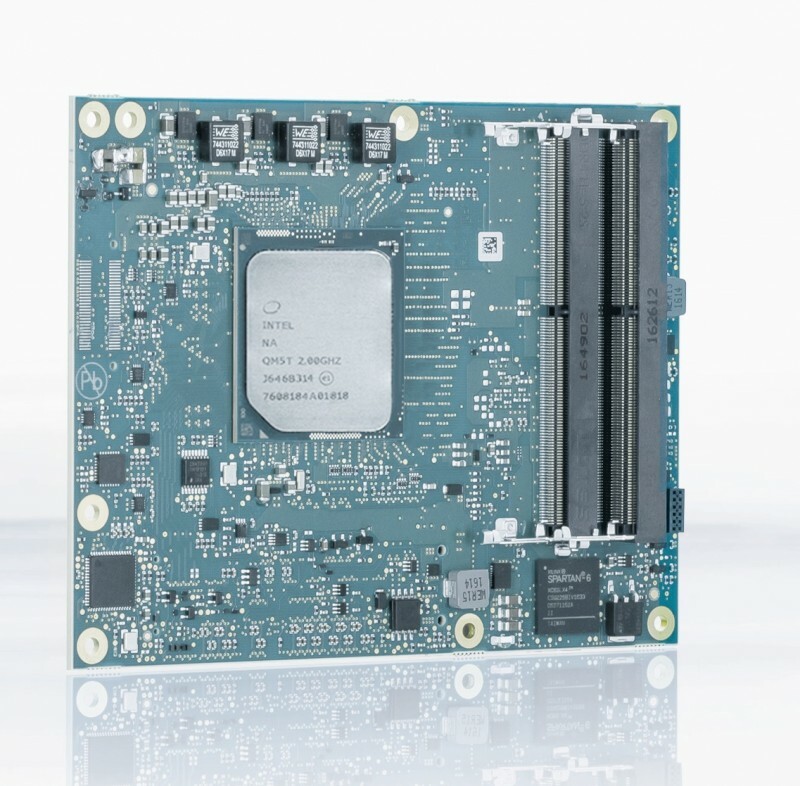 There is a simple and clever answer: Use COM Express Computer-on-Modules; and for the high-end systems leveraging the Intel® Core™ and Intel® Xeon® processors that can execute up to 12 threads with up to 4.4 GHz, use the COM Express Type 6 specification! You may wonder why COM Express Computer-on-Modules are so great. It’s because they can save developers around 50% to 90% of the effort required to build a suitable solution at the board level compared to full custom designs. At the same time, developers have just as much flexibility as with full custom designs to tailor their system to the dedicated requirements. The customization happens on the application-specific carrier board. This carries – nomen est omen – the fully developed Computer-on-Module that comes as a ready-to-buy super component already including a complete BSP with all required standard drivers. 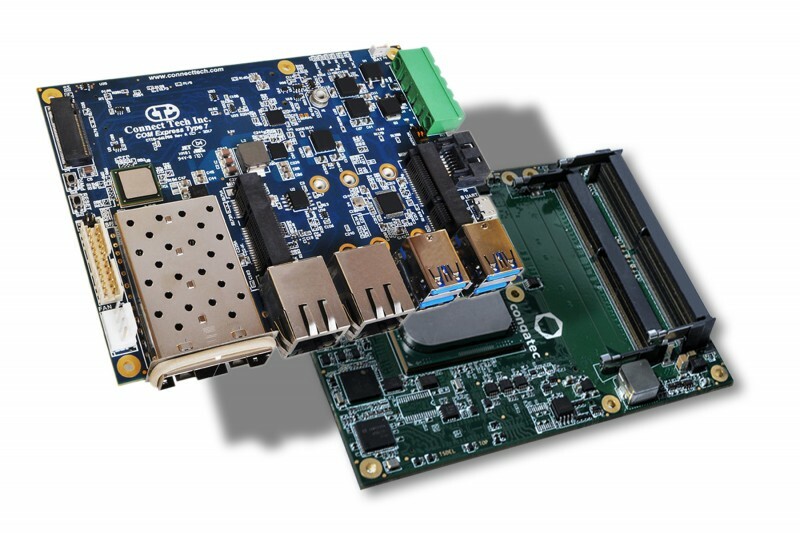 If system designers use carrier boards such as the conga-IT6 Mini-ITX form factor board, or the conga-TEVAL, then they can scale their designs across all the different BGA mounted COM Express Type 6 modules available on the global market by simply changing the module. And thanks to the COM Express specification, it is ensured that all modules from all vendors offer identical form factors, functions and dimensions including the cooling solution. So when developers have to integrate a new processor, they don’t have to dive into the gory PCB routing details of ultra-high-speed interfaces and memory specifications and all that. Instead, they only have to choose the suitable module and plug it in. Upgrades are now a question of minutes and not of days, weeks or months. Your advantages: The development becomes highly agile with a minimum time to market for new solutions. Additionally, developers can also make very efficient re-use of all their designs. And thanks to the huge COM Express ecosystem, they will get long term support as all major embedded vendors support this leading Computer-on-Module standard. OEMs also remain vendor independent and benefit from competitive pricing. Yet, they still have to design a carrier board, but here too, COM Express helps, as comprehensive specifications for the construction of a carrier board are available. This further simplifies the design of industrial-grade computers that are specifically tailored to their own requirements. 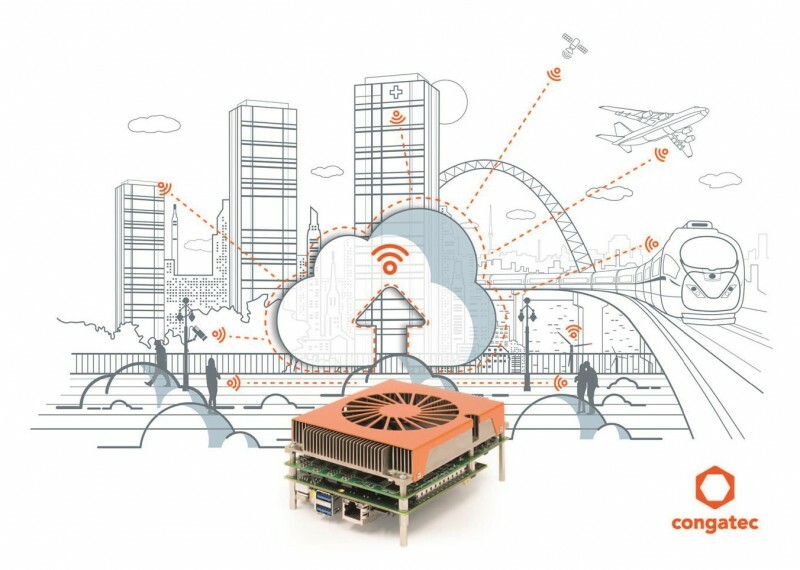 In an ever more connected world, Computer-on-Modules help engineers to most efficiently tailor their systems to always meet new needs. But task separation is not only a question of being able to most flexibly equip a system with multiple cores. On top, designers also need the suitable software in form of a hypervisor solution to separate different tasks from each other. With a real-time capable hypervisor, they can supplement their real-time control with additional virtual machines for IoT or Industry 4.0 connectivity. Here they should look out for tested and validated solutions that already have proven themselves in industrial control and other high-reliability sectors like medical. It is important though that the hypervisor can run a wide variety of real-time and general purpose operating systems and is not connected to a dedicated OS. Also, it should not add any extra latency to retain the performance and determinism of real-time applications. And last but not least, users should be able to install and configure it independently and without detailed hardware knowledge. An implementation project or customization that requires a dedicated engineer is too expensive and would add unnecessary efforts and costs. So look for an instantly deployable hypervisor solution, and you’ll benefit from similar advantages you have on the hardware level with Computer-on-Modules. 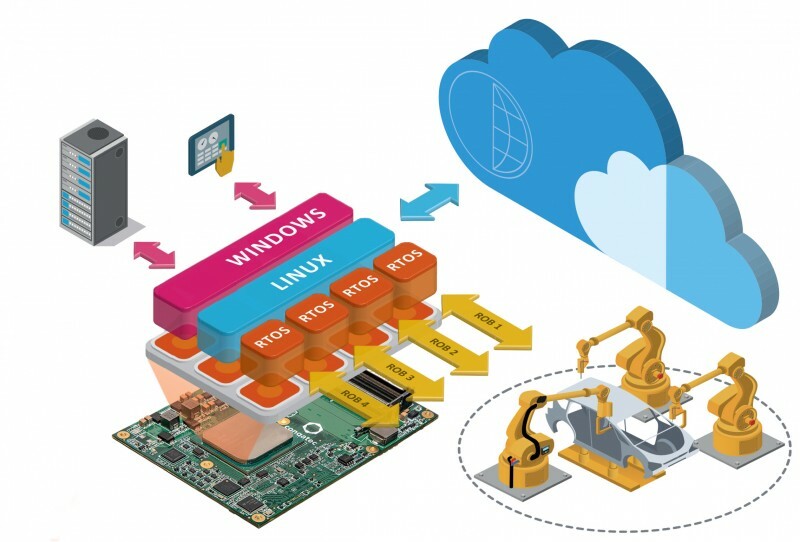 Designing a platform with hypervisor technologies, such as the RTS Hypervisor from Real-Time Systems that congatec has already pre-qualified for its conga-TS370, makes it quite straightforward to combine hard real-time processes with IIoT connectivity. 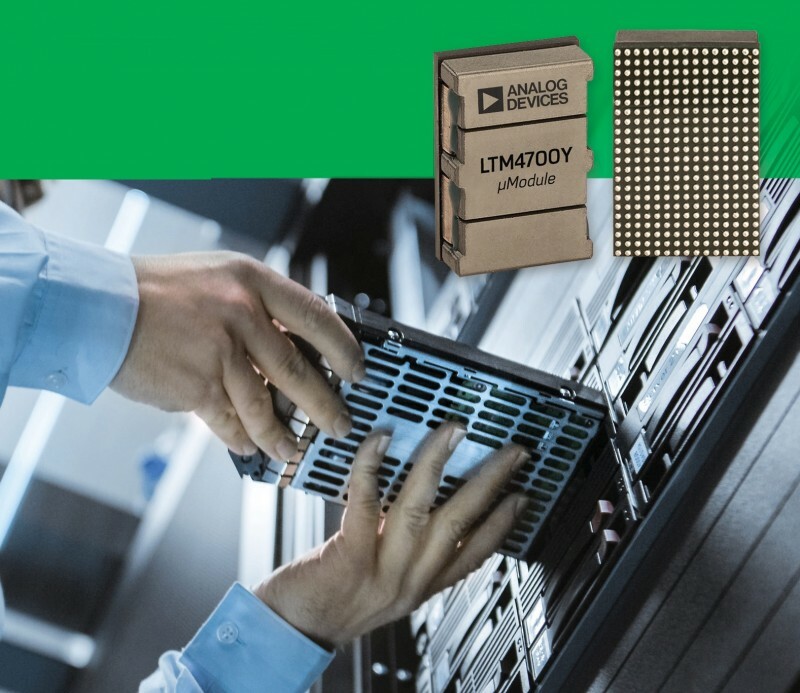 The new conga-TS370 modules with Intel® Xeon® and Intel® Core™ i7 processors have a TDP of 35 to 45 watts and support up to 32 GB DDR4 2666 RAM. Even with full virtualization and multiple virtual machines, each instance has more than enough memory as a result. For safety-critical applications, such as situational awareness for collaborative robots, optional Error Correction Code (ECC) support can be provided. In addition, the modules feature an impressive choice of high-bandwidth I/Os, including 4x USB 3.1 Gen 2 (10 Gbit/s), 8x USB 2.0 and 1x PEG and 8x PCIe Gen 3.0 lanes for powerful system extensions. Long-term availability of at least 10 years and Intel® Optane™ memory support plus extended security features such as Intel® Software Guard Extensions, Intel® Trusted Execution Engine and Intel® Platform Trust Technology add to the modules’ attraction. They further support all common Linux operating systems as well as the 64-bit versions of Microsoft Windows 10 and Windows 10 IoT. Kontron has introduced its COM Express COMe-bDV7 in the basic type 7 form factor. It is based on the Intel Atom processor C3000 product family offering scalable compute performance and network capabilities especially suitable for low-power entry-level server platforms. This latest COM Express module extends Kontron’s product family of server-class COM platforms. The COMe-bDV7 module features server-grade CPU performance with up to 16 cores. This robust performance is combined with support for up to four 10GbE-KR ports making it ideal for network intensive implementations. The KR design allows for maximum flexibility by defining the physical interface KR for backplane connectivity, Copper (RJ45) or fibre (SFP+) on the base board. Furthermore the available NC-SI signals allow for the connection of a Baseboard Management Controller (BMC) on the baseboard for the purpose of enabling out-of-band remote manageability. This enhances reliability and helps reduce the overall operating cost in general. In addition, the COMe-bDV7 supports up to 64 GB of ECC and non-ECC DDR4 memory for a well-balanced multi-core CPU versus memory-size approach. Furthermore the new COMe-bDV7 offers support for Kontron’s Security Solution APPROTECT. It is based on an integrated security chip from Wibu-Systems which in tandem with a specifically developed software framework protects applications, as well as all data processed and stored on the device. Additionally, Kontron’s APPROTECT Licensing enables new business models such as ‘pay per use’ or time-based trial versions, as it can be used to easily enable or disable features via a predetermined set of variables. With the new module Kontron’s customers will be able to take full advantage of Intel’s latest Intel Atom processors for entry-level server platforms offering scalable compute performance from 2 to 16 cores with high bandwidth memory (ECC) and I/O capacity for low-power fanless systems. Supporting up to four 10 GbE Ethernet interfaces, the Kontron module is designed for applications such as real-time Industry 4.0 fog servers, micro servers, network appliances, as well as industrial, energy, robotics and IIoT implementations with demanding network requirements. The module supports Linux, Windows Server 2012 R2, 2016, Windows 7 and 10 and VxWorks. The Kontron COMe-bDV7 is also available in industrial-grade versions making it an excellent solution for applications that operate in harsh environments. It is available immediately.